A late Jordan Murchison goal at Kilmallie finally confirmed that Skye Camanachd will return to top flight shinty after more than a decade in the lower leagues. The island side's 4-2 victory over their only remaining challengers wrapped up the Marine Harvest National Division title on the penultimate day of the programme. 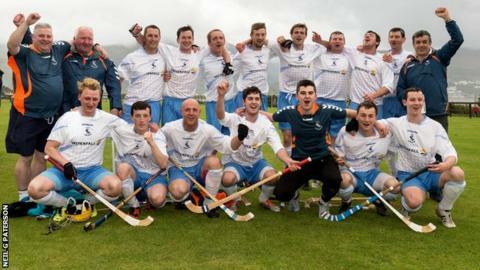 In the Premiership, Inveraray took another step towards replacing Skye in the second tier when they lost 4-1 at Kingussie to drop two points adrift of Oban Camanachd, who drew 1-1 at home to Kinlochshiel. A 4-0 away win over Glenurquhart ensured that champions Newtonmore remain a point clear of Kyles at the top. Kyles, who won 5-2 at Fort William, have played an extra game. It didn't start well for Skye when Liam MacDonald put Kilmallie ahead midway through the first half. Will Cowie equalised but John Stewart restored the home side's lead. Early in the second half Ian Nicholson drew Skye level again and with 18 minutes left Jonathan "Shockie" MacLennan put them ahead for the first time. The match was still on a knife edge until the dying seconds when Murchison's strike clinched the title for Skye. In the Premiership, Kingussie, battling to get further away from the relegation play off place, opened in the second minute of the second half through Ryan Borthwick. Fraser Watt drew Inveraray level on the hour but one each from Fraser Munro and Savio Genini in advance of Borthwick's second confirmed the points for the Badenoch team. At Oban, Oliver MacRae drew first blood for Kinlochshiel in the first half but Malcolm Clark's late equaliser advanced Camanachd to seven points with 11 of their 18 games played. Inveraray remain bottom with five points from 13 outings while Kingussie now have nine from 14. The bottom club will be relegated and whoever is second bottom will play off against Kilmallie. It was relatively plain sailing at Glenurquhart for Newtonmore who had Glen MacKintosh and Norman Campbell on target in the first half and Fraser MacKintosh then Campbell again in the second. Kyles rushed to an early 2-0 lead at Fort William when Roddy MacDonald and Grant Irvine both scored within the first three minutes. However, the game had not progressed past the half hour when the score reached 3-2 after a double from Gordie MacKinnon left it all square and MacDonald's second put Kyles ahead once more. There was then a goal drought for almost an hour before Irvine's second and Dunky Kerr made the final score 5-2. Elsewhere in the National Division, Blair Morrison scored four as Caberfeidh swamped Ballachulish 11-0 while Calum McLay's equaliser won a point for Glasgow Mid Argyll in a 2-2 draw at Beauly.